Touch Pro 2: Time To Reminisce? "While we don't have official word from Verizon, it appears that the Touch Pro 2's run has unexpectedly come to halt, at least for online sales." WMExperts has discovered that the HTC Touch Pro 2 is no longer available for order from Verizon (at least online). Is this the mark of the end of the line for this popular phone? I for one remember when I actually got to try this phone for the first time. I was very impressed with the form factor, particularly the screen size and the keyboard. I nearly bought one, but decided to hold out for the potential of buying the HD2. That never happened either, as that phone has never officially been released in Canada where I reside. Nevertheless, I did follow reviews of the Touch Pro 2, many of which were particularly positive. It's quite interesting to read the comments posted on this WMExperts article. I've no doubt that the Touch Pro 2 turned many people into smartphone enthusiasts. I like HTC products and am anxiously waiting to see what Windows Phone 7 goodies they have in mind for us. Are you a Touch Pro 2 owner? If so, let us know in the comments what you think of it. For the tl;dr crowd lemme summarize by saying: Have It! Love It! Let me first start off by saying I'm not much of a "phone" guy. By that, I mean that even counting freebie weekend and night minutes, I still never use more then 100-200 mins a month. For me, the TP2 is more of a mini-computer and entertainment device with a phone thrown in for occasional voice calls and for text messaging. My first PDA was an HP iPaq 2215. The thing was amazing, simply amazing. It had CF and SD slots so I could shoot pictures, pull the card out and view them on the larger screen, and then connect via bluetooth or cable to a cell phone and send them out immediately. The IR port worked great with Nevo as an all in one tv/stereo/other remote replacement and I could even trigger my camera and remote flashes with it! I bought a thinkoutside bluetooth keyboard, and a wifi card for it and was just happy as could be. I would type class notes on it, surf the web, send emails, I put tomtom on it and hooked it up to my nextel phone for gps, I spent hours on IRC and yahoo messenger from all over the world using it. Suffice to say, I worked that puppy to death and still use it every day in fact! When the rest of the world passed nextel by, I started looking to jump ship and I knew I wanted a device that could take the place of my beloved iPaq. The first thing that came out that seemed close was the Mogul, but in every respect it was a step backwards for me. No SD or CF slots, no IR port, the screen was tiny and the keyboard was horrible for me. They both had 400mhz processors, but the mogul seemed so much slower with the new OS then my old WM2003SE did! I passed on it. I looked and looked and looked and waited and waited and waited. Finally the Touch Pro came out and I thought... close... darn close... but still not quite there. I did go out and get a palm pre and tried it out for 20 days (california lets you try phones for 30) and I was just disheartened by the experience. I wanted to like it, I tried to like it, I loved the card system and pandora was amazing on it, but remember, I'm not a big phone guy, and all of the things I **needed** to do with it, well, there just weren't any apps for it yet! Plus the battery life on it was insanely bad. I even tried a 2nd one, and had the same results. I'm not around a plug much, and when I'm out and about, I need my phone to work. It wasn't until the TP2 was announced that FINALLY I found a device with a big enough screen to placate me. Still no CF or SD slots, still no IR port, but the screen was big and I knew I would find a lot of use from the tilt, plus, I found I could type rather well with the KB! From the moment I bought it, I've been happy with it. Like all WM devices, it needed a bit of tweaking, pushing, shoving and nudging, but it's never failed to do what I have asked it to. It's great for IRC and IM, Twitter, FB, Emails, and SMS, it's perfect to watch streaming TV, tethering is a breeze, putty, vnc, and ftp are no sweat, and with BT headphones and a 16gb card, it's great for music as well! The resistive screen is beautiful for precision handwriting, drawing diagrams, and pinpoint selection. I do a lot of custom GIS mapping and GPS work in the field that has specific WinMo programs that really take advantage of the screen of the TP2. It's worth noting that in my household I have an HD2 as well. I've played with it, used it, and I've come to realize that I absolutely love the size and speed of the device, but I am not ready to make the jump to capacitive screens just yet and I need my keyboard. I do too many things that require quick jots of notes, or moderate typing that is just impossible for me to accomplish on the HD2. I know that for what I do, the TP2 is the perfect internet, multimedia, and mini-computer. I'll be keeping it and using it for probably quite some time knowing how I am with devices. Oh and for those wondering about the 2215, one thing I dislike about the stock TP2 was the lack of being able to see tasks on the front screen without upgrading to sense 2.5 and installing cookies hometab with a cooked rom. What I found to be the perfect setup was to use both the 2215 and Tp2 in my vehicle. Having them mounted on the a/c vents in the center console, I can quickly see the tasks and appts for the day on the 2215 before starting tomtom on it. That leaves the TP2 screen available for calls and playing music with nitrogen player. One of the major drawbacks of a single device is that if a call comes in, it switches away from the navigation/traffic screen! Also, it's a pain in the rear to change songs! By leaving tomtom up on the 2215, and using the TP2 for a phone and music player, I dont have to worry about juggling all that stuff. I just use the BT to keep the 2215 synced and get traffic through the TP2's internet, and it works like a charm. Who knows, maybe just maybe, someday they'll make an HD2/TP2 hybrid with at least an IR port again. That thing was really really useful! USB host functionality would be great too! I do know one thing for sure, I have 0 want for Win7Phone or the ZunePhone or whatever the heck it is. Maybe by version 4 they'll be back to doing all of the things that my 2003 pda could do, but until then, it's a complete pass for me. I'll be keeping my tp2 for a while, or at least until GIS software comes out for android I guess. I also own a TP2 and for me it is nearly the perfect device now that I have tweaked, added and adjusted the applications. I am like Mountain343, I don't use it much as a phone - more as a micro laptop. For this the keyboard is vital so that all the screen is available to see the documents and presentations that I am editing (using Dataviz Documents To Go). A 16Gb card has my music and DVDs on. With the keyboard flipped out I can sit it on the table on a plane and watch movies or edit documents without having to hold it all the time to get the correct angle. For me WM7 is not looking too promising. Silliness like no cut and paste means I can not edit documents. I am not interested in social networking on my phone - my TP2 is a serious business tool and WM7 is not a serious business OS. Vague statements by MS about an enterprise edition some time in the future are not encouraging. I guess, therefore, I will stick with the TP2 for a while until MS (or, more likely Android) offer me a suitable replacement OS running on suitable replacement hardware. "Let me first start off by saying I'm not much of a "phone" guy. By that, I mean that even counting freebie weekend and night minutes, I still never use more then 100-200 mins a month. For me, the TP2 is more of a mini-computer and entertainment device with a phone thrown in for occasional voice calls and for text messaging. " I am that kind of a person also. I haven't owned any PDA for the phone. My first device was an HP Jornada 540 - no phone. I had a Touch Pro. My trouble with the Touch Pro was posted here earlier. I don't know if the problem was with Touch Pro or US Cellular. US Cellular kept exchanging the phone. They finally replaced it with a Touch Pro2. I didn't like it. Everyone at US Cellular could not believe I didnot like it. First off, I missed the D-pad. I loved the keyboard but I just never could set up my apps the way I used them. Some tech told me that if I needed to make a call I should take out the battery and reinsert it. Now how dumb is that - waiting for it to reboot when trying to dial 911? The TP2 was my first non-candybar form factor smartphone. I don't think it is asking too much to say it is the greatest WinMo phone HTC ever made. Sure the HD2 is faster and bigger, but without the physical keyboard, I think it falls into 2nd place behind the TP2. The TP2 was one of the few devices to be carried by all big 4 in the US, plus several in Canada, and many in the eastern hemisphere as well. A true sign that HTC got it all right with this one. It will be quite some time until you pry it from my hands! I have been using this phone for quite a while and I love it. I'm an IT professional and the great thing about the Windows Phones is that they can do just about anything you can think of, because developers have been writing software for a LONG time. It's hard to track down all the apps and utilities sometimes, but in the end you can customize a wonderful tool that does exactly what you need. It was kind of ridiculous jumping through as many hoops as needed to get logmein.com to work on it. But in the end, I was able to make a near perfect tool out of it. The downside to this phone is the interface. I don't have a problem because I voice dial and speed dial. Most of my customers that purchased this phone complained that they would accidentally call random people all day long. When they go to the contact list and try and scroll, touching the screen to scroll dialed the person instead. If you didn't get your swipe just right you ended up dialing some random person as you scrolled to find who you wanted. I had 4 customers that complained of the same problem. As this is primarily a phone, this was a deal breaker. It is kind of sad to so that such a great device was rendered un-usable to many because of such a design quirk. A couple of other things that I lament about this phone is the lack of FLASH for the camera. Why replace something irreplaceable (like a flash) for something that can be done on screen during a call like a mute button. Also, I was never a big fan of the trend to eliminate most of the buttons on a device. I would love to see an HTC version of the Samsung SCH-i760 form factor. Full QWERTY slide out keyboard, but still have buttons to dial on the front as well as a directional pad would be really useful. My previous device was HTC Diamond, small, light, cute..., but battery life wasn't all that good, screen was a tad small, it was slow-ish and typing anything on the screen was a pain. So I upgraded to TP2 about a year ago and I have to say that TP2 is the best WM phone device I ever used and I used quite a few (Himalaya, Universal, Wizzard, Trinity, Diamond). I love the keyboard, it's excelent, the battery life is quite good, screen is great and the speed is OK (can't compare to new Snapdragon devices). So all in all I'm quite satisfied with the TP2, although I would like faster CPU and especially better OS. WM even with twaked custom ROM is a pain and the worst part of the device. For now I'm sticking with TP2 and waiting if HTC releases something like TP3. I just wish they'd update it. I've been a long time WM user and waited for a decent phone to come to T-Mobile. 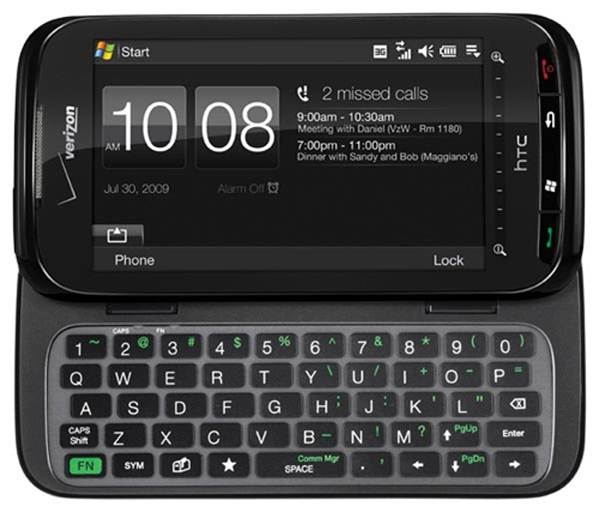 The TP2 was the best WM phone ever in terms of display, speed and keyboard. Then I got a HD2 which spoiled me on the display and speed. Now my TP2 is sitting in a drawer because the large capacitive touch screen and fast web browsing of the HD2 are just too compelling to stop using it. The ideal phone would be a TP2 form factor with a capacitive touch screen and snapdragon CPU (running WM 6.x). I took on the TP2 when I finally wised up and decided I didn't want to carry a phone AND a PDA anymore. Since I came from using an iPaq, and had lots of apps and files from it, a Win-based smartphone would make the transition easiest for me. The TP2 has been a great PDA and phone. I use it daily to keep track of personal and work files, view pics and video, read ebooks, access the web and edit Word documents... I'm so glad I got a physical keyboard device. And my Droid-using wife likes its clear screen and readability. I'm hoping to keep this baby for years, as it does everything I need for a smartphone. Steven Lyle Jordan: Original SF so good, Fox would never put in on the air.